Represents a control that allows the user to select a date. The DatePicker type exposes the following members. DatePicker Initializes a new instance of the DatePicker class. BlackoutDates Gets or sets a collection of dates that are marked as not selectable. CalendarStyle Gets or sets the style that is used when rendering the calendar. DisplayDate Gets or sets the date to display. DisplayDateEnd Gets or sets the last date to be displayed. DisplayDateStart Gets or sets the first date to be displayed. FirstDayOfWeek Gets or sets the day that is considered the beginning of the week. IsDropDownOpen Gets or sets a value that indicates whether the drop-down Calendar is open or closed. IsTodayHighlighted Gets or sets a value that indicates whether the current date will be highlighted. SelectedDate Gets or sets the currently selected date. SelectedDateFormat Gets or sets the format that is used to display the selected date. SelectionBackground Gets or sets the background used for selected dates. Text Gets the text that is displayed by the DatePicker, or sets the selected date. OnDateValidationError Raises the DateValidationError event. CalendarClosed Occurs when the drop-down Calendar is closed. CalendarOpened Occurs when the drop-down Calendar is opened. DateValidationError Occurs when Text is assigned a value that cannot be interpreted as a date. SelectedDateChanged Occurs when the SelectedDate property is changed. CalendarStyleProperty Identifies the CalendarStyle dependency property. DisplayDateEndProperty Identifies the DisplayDateEnd dependency property. DisplayDateProperty Identifies the DisplayDate dependency property. DisplayDateStartProperty Identifies the DisplayDateStart dependency property. FirstDayOfWeekProperty Identifies the FirstDayOfWeek dependency property. IsTodayHighlightedProperty Identifies the IsTodayHighlighted dependency property. SelectedDateFormatProperty Identifies the SelectedDateFormat dependency property. SelectedDateProperty Identifies the SelectedDate dependency property. The DatePicker control allows the user to select a date by either typing it into a text field or by using a drop-down Calendar control. Many of a DatePicker control's properties are for managing its built-in Calendar, and function identically to the equivalent property in Calendar. In particular, the DatePicker.IsTodayHighlighted, DatePicker.FirstDayOfWeek, DatePicker.BlackoutDates, DatePicker.DisplayDateStart, DisplayDateEnd, DatePicker.DisplayDate, and DatePicker.SelectedDate properties function identically to their Calendar counterparts. For more information, see Calendar. Users can type a date directly into a text field, which sets the Text property. If the DatePicker cannot convert the entered string to a valid date, the DateValidationError event will be raised. By default, this causes an exception, but an event handler for DateValidationError can set the ThrowException property to false and prevent an exception from being raised. To change the watermark hint displayed in a DatePicker control, see DatePickerTextBox.Watermark. The DatePicker control is available as part of the libraries in the Silverlight Software Development Kit (SDK). For more information, see the Silverlight Tools. To apply the same property settings to multiple DatePicker controls, use the Style property. To change the visual structure and visual behavior of a DatePicker, copy and modify its default style and template. For more information, see Control Customization. Dependency properties for this control might be set by the default style of the control. If a dependency property for a DatePicker is set by its default style, the property might change from its default value when the DatePicker appears in the application. For more information, see Dependency Property Value Precedence. You can get the default style and template for DatePicker from DatePicker Styles and Templates. Setting a visual property will only have an effect if that property is both present in DatePicker control's default template and is set by using a TemplateBinding. You can find a list of visual properties in the "Changing the Visual Structure of a Control" section of Customizing the Appearance of an Existing Control by Using a ControlTemplate. The following code and XAML creates a page with two Calendar controls and two DatePicker controls. The Calendar and DatePicker controls are configured in a variety of ways. To run this sample, create a Silverlight project named CalendarExample. In the project, add a reference to the System.Windows.Controls assembly and add the following code to the appropriate files. 'some dates to be unselectable. 'the drop-down calendar is opened or closed. text1.Text = "DatePicker Calendar opened!" text1.Text = "DatePicker Calendar closed!" 'Updates a TextBlock with information from the SelectedDateChanged event. 'RemovedItems will be null if this is the first time a date was selected. text1.Text = "Changed SelectedDate from nothing to " + e.AddedItems(0) + "!" text1.Text = "Changed SelectedDate from " + e.RemovedItems(0) + " to " + e.AddedItems(0) + "!" 'Updates a TextBlock with information from the DisplayDateChanged event. 'by user input or by code. 'This should never occur unless DisplayDate is explicitly set to nothing. text1.Text = "Changed DisplayDate from nothing to " + e.AddedDate + "!" text1.Text = "Changed DisplayDate from " + e.RemovedDate + " to " + e.AddedDate + "!" //some dates to be unselectable. //Hook up events to event handlers. //the drop-down calendar is opened or closed. //Updates a TextBlock with information from the SelectedDateChanged event. //RemovedItems will be null if this is the first time a date was selected. //Updates a TextBlock with information from the DisplayDateChanged event. //by user input or by code. //This should never occur unless DisplayDate is explicitly set to null. The previous example produces output that is similar to the following illustration. The first part of the illustration shows a DatePicker before it is selected. The second part of the illustration shows the DatePicker with the calendar visible. 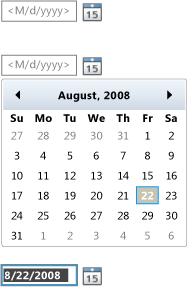 The third part of the illustration shows the DatePicker after a date has been selected.